Ruth and her beloved brother Philip find solace in the expanse of Tanglewoods'. There they escape into bird watching, climbing, and general misadventures with their friend Terry. But life with their Aunt is harsh and Ruth suffers from an incorrigible temper. Just when she thinks she can't take it anymore, she learns a very special secret about a very special Shepherd. 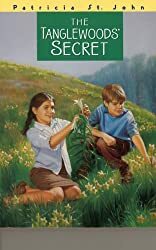 When a dreadful accident hurts one they love, Ruth and Philip learn that the Tanglewoods' Secret isn't meant to be kept a secret.